Clicking the "Advanced Installation" button on the welcome screen gives the user full control over the installation. If the installer allows installations for the current user as well as installations for all users and there is no existing installation, then the first step is to choose whether to install only for the current user or for all users. On Windows Vista and later, the button to install for all users will have a shield icon indicating that the usual black screen security prompt to request administrator privileges will follow. 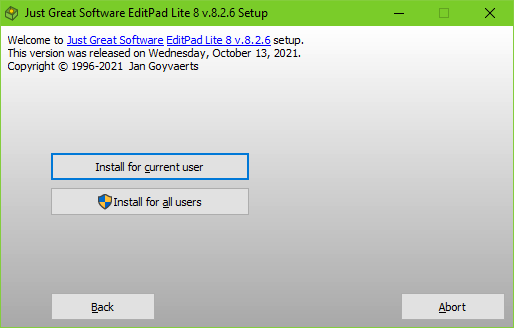 The next step allows the user to change the installation folders.